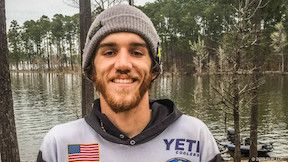 Jeremy Knepper of Montgomery, Texas, brought five bass to the scale Saturday weighing 27 pounds, 9 ounces, to win the Bass Fishing League (BFL) Cowboy Division tournament on Sam Rayburn Reservoir. Knepper took home $5,261 for his efforts. Knepper said he caught his fish flipping bushes along an approximately 200-yard stretch near Veach Basin. He said he’d had some success at the area in practice, and decided to return to it during the event. Bryan Trahan caught an 11.10 lbs bass, the heaviest of the event in the Boater Divisionl.